Teucrium cossonii majoricum is a member of the same Genus as Germander. This is a hard working group of plants that is very carefree. They tend to be insect free, water saving, and heat tolerant. As you can see this member of the Germander genus is an incredible bloomer. 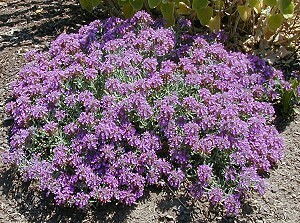 Fruity Teucrium makes an elegant blooming groundcover. It works well in many different situations, however it is not a ground cover to walk on. It stays short never getting more than about four inches. 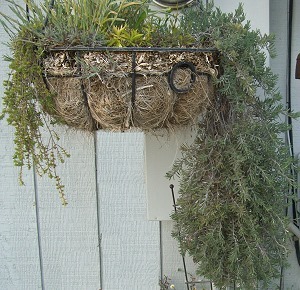 The long hanging plant on the left is Fruity Teucrium. Compare it to the Heretus Thyme on the left. It is definitely a show stopper both covered in blooms and after bloom.